I had a thought, but now it's gone. I am just interested stratigraphy and how they fit in with the bigger picture. Those are cool, would love to get it in the rock saw and make a number of cuts. Those are cool, would love to get it in the rock saw and make a number of cuts. Looking again at the last photo in the original post, I think I can see some layering in some of the thalli. I'd like to saw and thin-section one of the solid chunks to see if I can find any identifying features or structure. On some of the carbonates an acetate peel is a relatively cheap and quick way to make a quasi-thin section, as long as you aren't looking for non-carbonate grains. Just need some HCl, or formic or muriatic acid, 10%. Slab your sample and grind with 600 grit, dip and hold for 10-12 seconds in a pan of 10% acid, wash with water, spray with acetone, and place a sheet of clear acetate paper on top. let stand for 20 minutes and peel off. Cut and place the acetate peel between two glass plates, can't remember the preferred thickness, and then tape the plates together. Its not as good as a thin-section in my opinion, but it is larger and good for closer inspection of your fauna. I have some interesting stuff, but for some reason I haven;t been able to post any pics and haven't had time to sit and work on it. For some reason it's one of those things, like programming a VCR, that I always have trouble with. On some of the carbonates an acetate peel is a relatively cheap and quick way to make a quasi-thin section, as long as you aren't looking for non-carbonate grains. Just need some ........ it is larger and good for closer inspection of your fauna. Yeah, my rocks also flash '12:00'. I will have to bookmark your instructions and try the acetate peel process on some bitterly cold day. One other thing on the acetate peels, fill a pan with the acid solution (maybe 1/2" deep), hold the ground face in the solution, but don't touch the bottom. Also, when putting the acetate paper on smooth out, removing bubbles. Just for fun, here is my first thought, when I saw your first photos. I am just interested stratigraphy and how they fit in with the bigger picture. The outcropping with the 'pahoeid' beds and overlying sponge-bearing shale are shown in the middle. The Argentine is the thick limestone on top. About 1.25 miles to the south, there is Argentine overlying thick shale at about the same elevation, but sponges and 'pahoeid'-bearing limestones are absent in the shale, and only a couple Heliospongia were found in the thick-bedded limestone. About 0.5 to 0.75 miles to the north, there is an outcropping that is all Argentine that is significantly lower in elevation than the 'pahoeid' beds. Knowing that there is a large algal build-up to the north, this is striking to see in person. Apparently, the beds bearing 'pahoeids' and sponges rapidly pinch out to the north, and their presence there was somehow due to their proximity to the algal reef. Perhaps ocean current patterns favored their growth in that spot. From KGS Bulletin 198. Referring to the Frisbie Lmst. Field description--The stromatolite-sponge facies typically occurs as one or two massive, dark bluish-gray limestone beds overlying a shale. At the base of the limestone in most exposures are a few, thin, slabby layers of shaly biomicrudite representing the downward transition to shale. 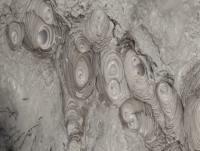 The underside of these shaly biomicrudite layers exhibits overlapping burrows averaging 1 inch in diameter and extending downward into the topmost layer of shale. Burrow mottling is present throughout the stromatolite-sponge facies. 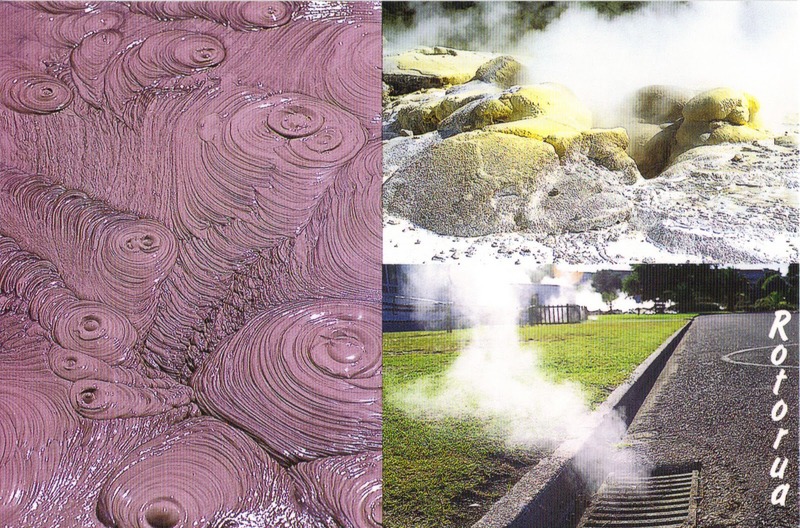 Characteristic laminated algal stromatolites and calcisponges are readily apparent in the field. The stromatolites are space-linked hemispheroids (Logan, Rezak, and Ginsburg, 1964), and appear as isolated crusts, averaging about 0.5 cm in thickness and 5 to 10 cm in length (Fig. 16, A). They may occur in growth position scattered throughout dark, burrow-mottled, intraclastic biolithite or as fragments rolled out of place in biomicrudite or intramicrudite. 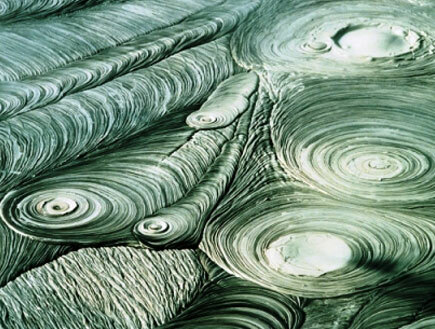 Domal irregularities in the crusts are small and occur at irregular intervals around intraclasts of carbonate mud and shell fragments, and over microrelief in the substrate. Locally, voids formed by mud-cracking beneath algal crusts were sheltered from infilling by carbonate mud (Fig. 16, A). Increase in thickness, length, and density of laminated algal crusts is associated with increase in brecciation and fossil abundance in the micrite. Perhaps you have already seen this. Yes, I actually pulled that bulletin out and thumbed through it last night. I'm still scratching my head trying to figure how the 'pahoeid' beds fit into the reef. The beds could be the sponge-stromatolite facies, but with an influx of terrigenous mud. It's too bad the publication was written just before they built the highway that cuts straight through the reef. Not only did they miss the 'pahoeid' and sponge beds, they missed a lithographic limestone that contains a marine fauna (including a unique assemblage of scaphopods) mixed with fragmental land plants. These were found in the Palau Islands, west Pacific. I thought that was lichen until I looked closer. Note the sub-millimeter thickness (if you can see it; it was hard to get a good, clear photo). These branching structures seem to have the form of ribbons with upturned edges (the bottom sides of the fossils are preserved). There would have to be some really interesting taphonomic processes for a Rhizocorallum trace to end up like this. So that encrusting bryo is on the bottom side of one of these? -Not that I assumed it would be the other way, necessarily. I assumed that too, but it took me a while to figure it out. The fossils were easy to find only after they had separated from the outcrop and were cleaned off by rain. I eventually worked a couple slabs out of the outcrops and found the fossils on the bottom sides. All this tells me that the thalli were erect to some degree when alive. The smooth type (with attached bryozoan) is on the left. A segmented type is on the right. The orangish sediment probably began to fill the thalli while they were still living. This piece reminds me of one of those champagne pyramids. Yes, I like that last piece - very illustrative, esp. if you found it in that orientation in the bedrock. I don't remember if you said whether any of this described in the local literature? If not maybe you've got the beginnings of a paper..
That's the most interesting thing about the segmented thalli. I have been unable to find anything like them in the literature -- alive or otherwise. It's possible that they are a common type of phylloid algae preserved under extremely unusual conditions, or perhaps they are something new altogether. Even so, I haven't seen any other instances of Archaeolithophyllum or other phylloids being preserved in this manner. In all other cases, they have been locked away in dense limestone. Any study of the form of these alga required painstaking serial sectioning of blocks. You're lucky to have found what you found. I would think they would make a new study a lot easier than the slicing, etc. This summer I found a sheet of what looks like a calcareous alga (I guess) better than my earlier ones - it covers a whole bedding surface about 2' square and it has bumps similar to your specimen above. I will have to post it in the Show Us Your Algae topic once I get decent pics. I'm looking forward to the pics. We haven't had much sun lately up here lately, which I need to take decent pics. Anyway I'm not sure mine and yours are closely related - the bumps on mine are more variable and randomly spaced, and the thickness of the calcareous 'layer' is always 1mm or more (sometimes quite a bit more, esp. at the bumps), but it is reminiscent.